Published November 8, 2012 By Anna T. This post may contain affiliate links. Regardless, I only recommend sites I've researched and/or used and trust. 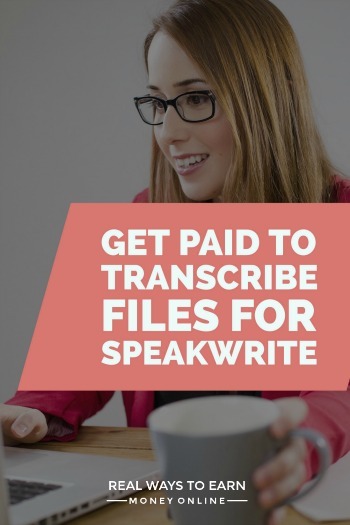 If you have at least two years of past transcription experience (particularly with legal transcription jobs), you may be able to get a job at SpeakWrite. This is a reputable company that is almost always hiring for legal transcribers. While they do occasionally have openings for general transcribers, this doesn't happen every often. SpeakWrite hires throughout the US and also in Canada. New to transcription? Then this job probably isn't for you, but there are other companies that would give you a chance. I have a full list of transcription companies for beginners if you'd like to check that out. How much is the pay at SpeakWrite? SpeakWrite pays a half cent a word transcribed. They claim that for most people, this equals anywhere between $12 and $15 an hour. However, I was reading about this company on the forums and many people say it varies a lot. If the files you get are difficult to understand or you get interrupted often while you're working (and this does happen when you have kids at home with you), you might make below $10 an hour. But then you might have good days where you're able to earn a lot more than that. The company has the option of either check or direct deposit and they pay twice a month. Canadian workers are not eligible for direct deposit, only check. Related: FREE 5-day general transcription mini e-course – learn what you can earn and what it takes to start! Both the legal and general transcriber positions have specific requirements and must be able to type at least 65 words per minute. For the legal transcriber position, you must have at least 24 months of increasingly responsible legal work in a law firm, not more than five years previous to the date of application as well as knowledge of the set up of legal pleadings, agreements, court headings, interrogatories, deposition summaries, formal correspondence, etc. You also must know how to format legal citations. If you are applying as a general transcriber (and they do not often need workers for this position), you'll need at least 24 months of transcription experience not more than five years previous to the date of application. SpeakWrite operates 24 hours a day, seven days a week. When you read their website, it appears that the schedule is pretty flexible. You are an independent contractor, so you can work as much or as little as you want provided the work is there for you to do. They have a scheduling tool that you use to schedule yourself for certain hours in advance. You can schedule yourself up to two weeks in advance for hours. I did find out that it's not always possible to get the hours you want. They divide their workers into groups and certain groups are able to claim priority hours. So when you go to schedule yourself, you may not be able to get the hours you want depending on what's made available to you to schedule if I'm understanding correctly. To get in, you have to take a typing test first so they can be sure you type fast enough. You can take this over again as many times as you need to until your score is up to par with what they want. Then you fill out a work history form and confidentiality agreement. After they accept these things, they let you start training which from what I understand is not super easy to get through. The entire process will probably take at least a few days to finish. You need a PC (no Macs) as well as high speed internet. If you don't already have one, you'll also need a foot pedal. You can go through the training without the pedal if you need to and then wait to order the pedal once you know you have the job. A printer and earphones are also necessary. Will SpeakWrite have enough work to keep you busy? As of the date of this blog post, their website states that they have more than enough files to keep their workers working as much they want. Still, I always say no matter what you're doing from home to have a “backup job” just in case the well runs dry where you're currently working. What do other workers say about SpeakWrite? I checked Glassdoor for reviews on this company, and the feedback overall is pretty good from the people who have or currently are working there. There are some complaints about the proofreaders and how they are condescending and give inconsistent ratings. Some people also complain that the pay rate is not enough considering how difficult much of the audio is to transcribe. You can go here to start your application. Good luck and as always, please share whatever experience you have with the company if you have it. Are you serious about pursuing a career in transcription? If you don't know a lot about transcribing from home and are very curious about doing this as your career, here are the resources and further reading we have vetted and recommend for you! Transcription Foundations – a free 7-lesson mini-course that teaches you all about general transcription, how much you can earn, where to find work, and more. Jumpstart Your General Transcription Career – the most informative transcription eBook you'll find, at just $5.99, written by transcriptionist and fellow work at home blogger Lisa Mills. CareerStep – the course many aspiring medical transcribers take for training. Payment plans available, plus financial assistance for military spouses. Good luck in however you choose to approach transcription. It can be a great way to earn an income from home! I agree. I have been transcribing for a doctor for over 10 years and have my own equipment, infinity foot pedal, stellar headphones, and use Dragon Naturally Speaking software to avoid hand cramping. When I called the support line during an application online for REV, I was told that my foot pedal would work with their editing program AFTER I passed the audio transcription test. When I inquired as to how to use my expensive Dragon software to get work completed faster for the company, the response was, “We don’t recommend translating software as it is cheating and may effect your “score”. WOW. obviously they have no clue about the modern advancements in transcription as the Dragon software still requires a dictation by (me). If it autotranscribed their audio files without a real person as the middle man, I would think they could save tons by eliminating a real person transcriptionist don’t ya think?? ?